(Newser) – These days, each and every political candidate can agree on one thing: How much they love their families. Voters practically insist that presidential candidates, in particular, exhibit close familial relationships—but, as Michael Kazin points out in the New Republic, hardly any of our best presidents actually fit that bill. Kazin offers numerous examples, from George Washington, whose wife once likened herself to "a state prisoner," to Franklin Roosevelt, who stopped sharing a bed with his wife before becoming the president, to even Ronald Reagan, who, though he doted on Nancy, was a distant father. Woodrow Wilson was a horrible president, why is he on that list. He is a counter example to the point their making. Since when is Reagan one of our best presidents. I like the way the writer slips in Reagan? 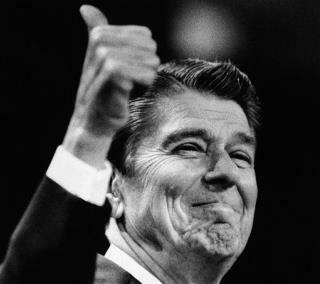 Let's be perfectly honest Reagan was no better than average if that. If you didn't live through it you wouldn't know how tough those times were especially for young people.It sucked and Reagan was a tool and that's not cool. Ronnie thought AIDS was gods wrath on gays and didn't recognize it as a very serious epidemic putting all Americans in the path of danger just because he was a homophobic. Never elect an actor the world is their stage it's and it's all make believe.